Rihanna recently performed at Summer Sonic Festival in Osaka, Japan. She wore a custom black bra by Adam Selman, a vintage Egyptian necklace from Susan Caplan and a wrap skirt by Norma Kamali. The dark gold lamé skirt is from Kamali’s Wrap And Tie collection. 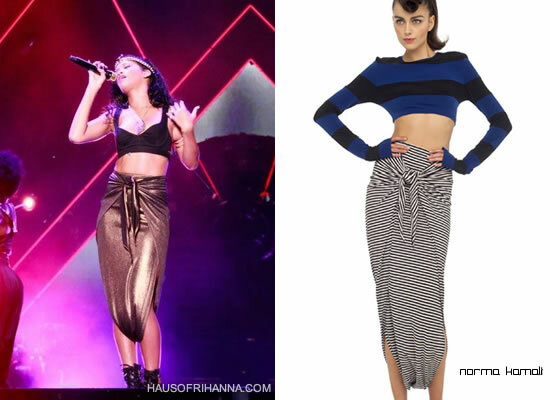 Rih’s colour is not available but you can get it for $345 in striped (pictured above) and a few other colours from the online store.